A weekend derailment has a city councillor calling for a plan to move dangerous goods shipments to a new rail line that would circumvent Edmonton. No one was injured Sunday when eight empty cars from a Canadian National Railway freight train derailed on an overpass near 97th Street and Yellowhead Trail. Ward 4 Coun. Ed Gibbons said it’s fortunate that nothing was inside the cars. He worries the outcome could have been potentially worse had they been tankers carrying dangerous goods. Gibbons is pushing for a new rail line that would divert dangerous goods and other rail freight around the city rather than through it. “We need to build something outside city corridors that rail could move on and move quicker,” Gibbons said. 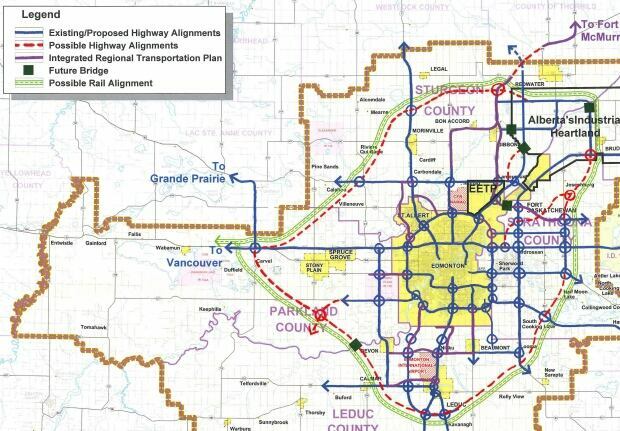 The line, similar in style to a ring road, would be built in the counties of Sturgeon, Strathcona, Leduc and Parkland. It would be north of Redwater, south of Leduc, west of Duffield and east of Bruderheim. Gibbons has pitched the plan to provincial politicians, federal and to CN Rail, but it’s currently just a proposal by the Capital Region Board, which includes Edmonton and 23 surrounding municipalities. Gibbons believes it’s time to give the plan another look. “We’re always envisioning what could go wrong and making sure we’re ahead of it for the next 30 years,” he said. Ken Smuda was sleeping on Sunday morning when he was woken by a loud crash that was followed by the sounds of emergency vehicles near his home close to Yellowhead Trail & 97th Street. Like Gibbons, he also worries about what could have happened if one of the rail cars had the potential to explode. Smuda supports the councillor’s proposed dangerous goods route around the city. But Gregg Marko, who also lives near the same rail line, doesn’t worry about trains and the dangerous goods they move. The cause of the derailment on Sunday is still under investigation. On Friday, June 3, a Union Pacific train carrying Bakken crude oil derailed in the town of Mosier, Ore. Fourteen rail cars came off the tracks, and four exploded over a 5 hour period. There are several things that the City Council needs to keep in mind whenever they re-open discussion of the appeal of the Planning Commission’s unanimous decision to reject the Valero Crude-by-Rail project. Many of the assurances given to the public about the safety of transporting crude by rail have been called into question by this derailment. The train cars that derailed and exploded are the upgraded CPC-1232 version promised to be used by Valero for this project. The train derailed at a relatively slow speed as it passed through the small town of Mosier. Union Pacific trains carrying Bakken to Valero will travel at speeds up to 50 mph in most of Solano County. The portion of track on which the train derailed had been inspected by Union Pacific three days before the derailment. A Union Pacific spokesman, while apologizing for the derailment and fire, would not answer a reporter’s question as to whether the Bakken oil had been stabilized with the removal of volatile gases prior to shipment. At the Planning Commission hearing, I tried repeatedly without success to get an answer from both UP and Valero as to whether they intended to de-gassify the Bakken oil prior to transport. A major interstate, Interstate 84, was closed for 10 hours in both directions while first responders used river water to try and cool the tank cars to a point where foam could be used to try and put out the fire. It took more than 12 hours to stabilize the scene. An oil sheen is in the river, despite the deployment of containment booms. “Jim Appleton, the fire chief in Mosier, Ore., said in the past, he’s tried to reassure his town that the Union Pacific Railroad has a great safety record and that rail accidents are rare. “After a long night working with hazardous material teams and firefighters from across the Northwest to extinguish a fire that started when a train carrying Bakken crude derailed in his town, Appleton no longer believes shipping oil by rail is safe. When the City Council took up the appeal of the Planning Commission decision in April, Mayor Patterson and Councilmember Campbell stated their opposition to the project, while the other three councilmembers (Hughes, Schwartzman and Strawbridge) approved Valero’s request to delay a decision on this project until at least Sept. 20. There is still time for the citizens of Benicia to tell their elected officials how they feel about this project. I urge them to do so. Steve Young, a member of the Benicia Planning Commission, is running for the Benicia City Council in November. They’re explosive. Pervasive. And their movements are cloaked in secrecy. Their nickname? Bomb trains. And they roll through the heart of Chicago. BY Ted C. Fishman, April 25, 2016 9:35 A.M. They could not look more ominous. The long coal-black tubes announce themselves by their distinctive shape and color, their markings too small to read from the street. The 30,000-gallon tank cars roll, sometimes 100 at a time, in trains of up to one mile in length. Their cargo? Crude oil—as much as three million gallons per train. Nearly all of it is light sweet Bakken crude, a type that is particularly explosive. In whole, these trains constitute likely the biggest, heaviest, and longest combustibles to ever traverse America, and they do so routinely. More pass through Chicago than any other big metro area. Their blast potential has earned them a terrifying nickname: bomb trains. Stand long enough at 18th and Wentworth, on the traffic bridge that separates the newer sections of Chinatown from the largely residential South Loop, and you will spot the tank cars wending their way across neighborhoods on the Near South and West Sides, past playgrounds, schoolyards, and row after row of houses. An estimated 40 of these trains cut through the metro area weekly. There’s no public information on exact routes or timetables; revealing their paths, the logic goes, might aid potential saboteurs, a real risk in an age of terrorism. Until recently, crude on the rails was relatively rare. But since 2008, when Bakken oil began rolling out of newly active fields in the United States—North Dakota is the biggest producer—and toward Eastern refineries, the number of oil tank car shipments has grown 50-fold. That’s pushed the number of accidents up, too. According to U.S. government data, from 1975 to 2012, an average of 25 crude oil spills from tank cars occurred on the rails each year. In 2014, that number rose to 141. Most incidents are minor, such as small leaks. But in cases of a major derailment, the result can be catastrophic, even fatal (see “Terrifying Incidents,” below). Chicago found that in the last three years there were 17 derailments of crude oil trains in North America significant enough to generate news coverage. In eight of them, the tank cars blew, sending fireballs hundreds of feet into the air, filling the sky with black mushroom clouds. In the most severe cases, the flames produced are so hot that firefighters almost inevitably choose to let them burn out, which can take days, rather than extinguish them. (The Wall Street Journal calculated that a single tank car of sweet crude carries the energy equivalent of two million sticks of dynamite.) Even when there are no explosions, the spills can wreak havoc on the environment: five of the 17 accidents resulted in the pollution of major waterways, affecting thousands of people across the continent. Many of these trains cut through what were once industrial rail yards in the city and suburbs. Over the last 35 years, however, much of that property has turned into residential and commercial clusters. “You should assume that if you live in the Chicago area, near a railroad track, that there are trains carrying Bakken crude oil,” says Jim Healy, a member of the DuPage County Board. Though Chicago has so far been spared a crude oil train crash, the potential of one presents a horrifying picture. One particular nightmare is emblazoned in the minds of first responders, and regulators. On July 6, 2013, a runaway crude oil train, which had been left unattended, sped through the center of the small Quebec town of Lac-Mégantic. Sixty-three cars derailed. Forty-seven people were killed, some literally incinerated while they drank at a bar. Emergency responders in the Chicago area say they are confident any derailment here could be managed before it reached neighborhood-destroying levels. “Crude is not the threat that everyone says it is,” says Gene Ryan, chief of planning for Cook County’s Department of Homeland Security and Emergency Management. Ryan and a group of first responders looked closely at 29 major accidents across North America and found that “even though the crude is full of all kinds of volatile materials, the cars did not completely blow apart and hit homes,” he says. Experts believe the train was likely headed for Chicago, 160 miles to the east. Historically, oil in America moved from south (think Texas and Louisiana) to north mostly through pipelines, the safest conduits for it. When newly deployed technologies such as horizontal drilling and hydraulic fracturing—or fracking—opened access to sources of oil in North Dakota and elsewhere in the West, few pipelines were in place to move the crude to the refineries back east that could handle it. (A proposed pipeline for Bakken crude running from Stanley, North Dakota, to Patoka, Illinois, has faced political and jurisdictional challenges.) With limited alternatives, oil producers and refiners turned to railroads. In 2014, trains carried 11 percent of the nation’s crude oil. Using freight maps and firsthand reporting, the West Coast environmental advocacy group Stand has assembled a national map of the most common crude oil train routes and created an interactive website that allows users to determine how far any U.S. location is from these routes. 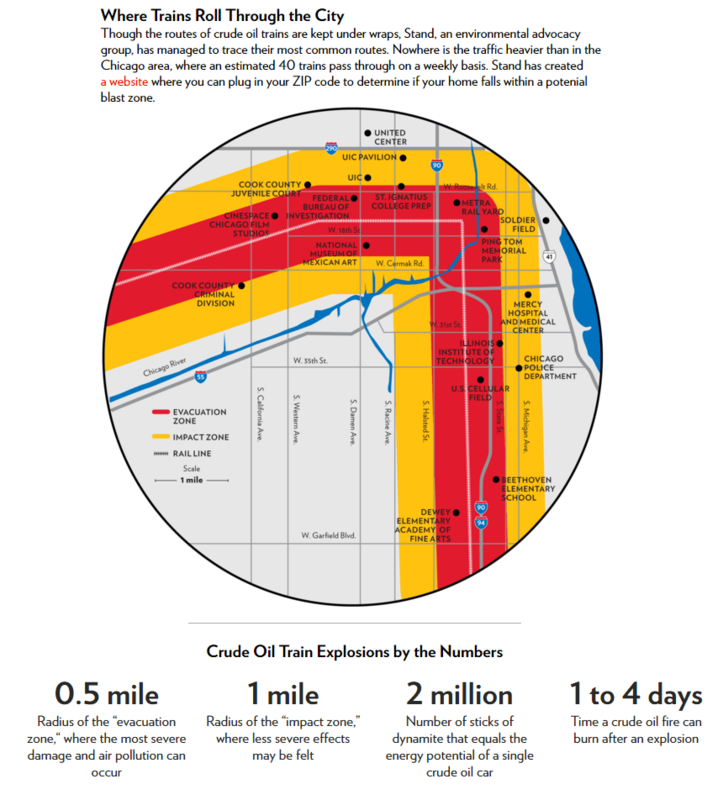 For example, according to the site, half of Chicago’s Bridgeport neighborhood, home to 32,000 people and U.S. Cellular Field, falls squarely within a half-mile “evacuation zone,” established by the U.S. Department of Transportation for areas vulnerable to crude oil train explosions. Stretch that to the one-mile “impact zone” and you include the Illinois Institute of Technology, University of Illinois at Chicago, and Cook County Juvenile Court. Last April, the U.S. Department of Transportation ordered a maximum speed for crude oil trains of 40 miles an hour in populous areas. The majority of railroads run them 10 miles slower than that, an acknowledgment, in effect, that the trains aren’t invulnerable. Most often, it is a flawed track, wheel, or axle that leads to a derailment, which can then cause tank cars to rupture. 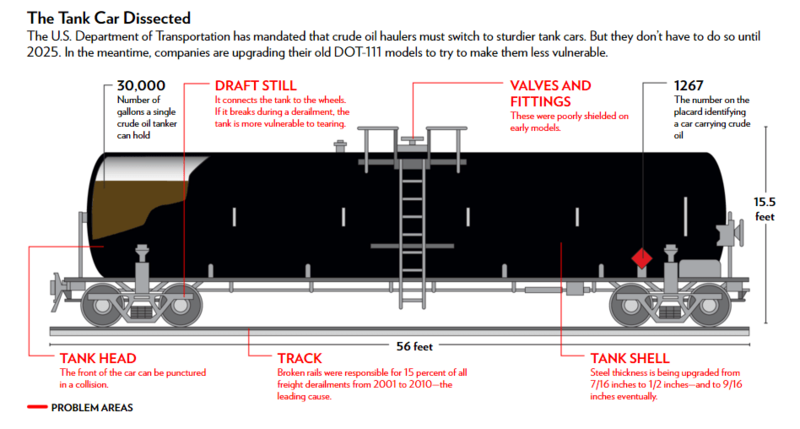 Bakken crude was first shipped using tank cars designed for nonhazardous materials and ill suited to its volatility. (Most tank cars are owned not by the railroads but by the oil producers and refiners, such as Valero Energy and Phillips 66, that ship crude.) Those first-generation tank cars, called DOT-111s, have almost all been subjected to new protections, including having their shells reinforced with steel a sixteenth of an inch thicker than used in earlier models. Federal regulations passed in 2015 mandate that by 2025 haulers must replace all cars with new models featuring even thicker steel shells and other safety measures. Railroads know the dangers. In addition to the human and environmental costs, one terrible accident could put a railroad company out of business. Montreal, Maine & Atlantic Railway, which ran the train that devastated Lac-Mégantic, could only cover a fraction of its hundreds of millions of dollars in liabilities and went bankrupt. The big railroads hauling crude in the United States and Canada have spent heavily on new technology to make their lines safer, including an Association of American Rails app called AskRail, which identifies the contents and location of rail cars carrying hazardous materials. What railroad companies cannot yet do is reroute trains away from the populous areas whose growth their lines once spurred. There simply isn’t the infrastructure in place to do so. And while the American Association of Railroads reports that rail companies have spent $600 billion since 1980 improving their current routes, even well-maintained tracks remain vulnerable. Department of Transportation accident data shows that broken rails were the main cause of freight derailments from 2001 to 2010. What’s more, the Federal Rail Administration, the agency charged with overseeing the integrity of America’s tracks, says it can only monitor less than 1 percent of the federally regulated rail system annually due to a shortage of manpower. In the worst recent accident, 63 cars on a runaway train derailed in the heart of this Canadian town. The resulting blast and flames killed 47 residents and destroyed 30 buildings in the small downtown. Outside this tiny Southern town, 25 cars spilled nearly 750,000 gallons of oil into surrounding wetlands, creating an environmental nightmare. After two trains collided, 18 cars on the one carrying crude oil spilled nearly 400,000 gallons. Enroute from Chicago, a train went off the track and crashed into a downtown industrail building. A train from Chicago derailed near a pedestrian waterfront area, sending three cars—and 30,000 gallons of oil—into the James River. After 27 cars went off the track during a snowstorm and exploded, the fire burned for four days. A train likely headed to Chicago derailed on a remote stretch of track, sending cars down an embankment. Even though the cars had been reinforced with half an inch of steel, the fire burned for three days. Just one month after a derailment in the same area, five cars fell into the Makami River, leaking oil into waterways used by locals for drinking and fishing. Five cars exploded and spilled nearly 60,000 gallons of oil. Fire crews from three nearby towns were called to help fight the blaze. Twenty cars toppled from the track, with three spilling a total of 35,000 gallons of oil, forcing 30 people to evacuate.